Are you as stunned as I am that Thanksgiving is on Thursday and that Christmas is only 33 days away? This year has just flown by. Last December, just after Christmas, I started this blog (www.izannahwalker.com) to give dollmakers additional information about using my Izannah Walker Doll clothes pattern and to chronicle my adventures while working on a set of patterns and instructions for a class on Izannah Walker Reproduction Dolls. It’s been a crazy year and I haven’t gotten as many blog posts up as I would have liked, but I have made quite a bit of progress on my pattern drafting and instructions. This is a project that has been in the planning stages for five years, so I am quite thrilled to be able to say that I am finally close to completion. Normally I would just wait until the class was ready to go before putting out any type of announcement. However something happened last week that made me change my mind. I received several orders for Spun Cotton Ornament Classes that people happened to mention were Christmas presents. Every year, quite a few husbands buy the classes for their wives. I suddenly realized that maybe some of you, who have been waiting patiently for me to finish the class, might want to put it on your Christmas List this year. For those of you who aren’t dollmakers, I also have some wonderful new items about which you might want to drop hints to Santa. They will be up on my website in the next couple of weeks and will include new teddies, an adorable sock monkey, a C.W. Parker c. 1930 carousel horse and some very intriguing Victorian folk art wool balls. Best wishes to all of you and yours for a truly bountiful and memorable Thanksgiving! Please scroll down to read details about my Izannah Walker Dollmaking Class. To the best of my knowledge, this is the only comprehensive tutorial on how to make an authentic Izannah Walker reproduction doll and her clothing. I based this class on Izannah Walker’s original patent and drafted my doll and clothing patterns from two dolls I own that were made by Izannah Walker. This is not a corner-cutting compromise approach, yet if you know how to sew, sculpt and paint and are willing to invest the time, you could end up with the best reproduction Izannah Walker doll in existence! Additional information provided via my Izannah Walker-themed blog, izannahwalker.com. An optional material kit is also available at an additional charge. It includes historically-correct fabrics, antique notions (buttons and lace) and stuffing, enough to make one complete, fully-dressed doll. You will still need your own sculpting, mold-making and painting supplies. With the detailed instruction booklet, you don’t have to be connected to the internet or be limited to working in front of your television screen. To take this class in person, it would be a five-day session, with a cost of $700 for tuition and all materials, not to mention your travel expenses. The regular price of this class will be $250. The optional material kit may be ordered for an additional $115. 75. Early ordering is now available at 10 percent off the regular prices above. Pay a deposit of 25 percent of the discounted price now with the balance due upon shipment. This deposit is non-refundable. The above offer will be good through January 1, 2010 only. After that date, pre-orders will still be taken, but will be at full price and may not ship on the initial release date of end of February. In addition to the 10 percent savings, a benefit in buying now is that you will be assured of being in the first group to receive your class when they are ready. As with all my products, the Izannah Walker Doll Class by Mail includes free shipping. All sales are final. Returns are not accepted. The doll pattern is not for sale separately, nor would it be possible to reproduce the doll without the rest of the class. To place your order, go to the classes section of my website, asweetrembrance.com. During 2010, I plan to offer additional clothing patterns drafted from items of original Izannah Walker doll clothing from my collection. Those who pre-order the class prior to January 1, 2010 will receive the same 10 percent off on every new Izannah Walker doll clothing pattern I release in this coming year during their first month of availability. Watch for the announcements and your special limited-time ordering instructions! 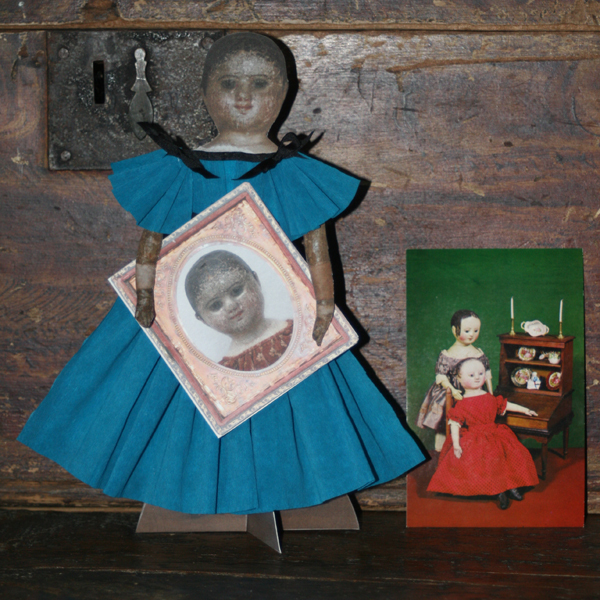 Dollmakers who sell their works may sell a limited number of dolls made from the patterns included in this class as long as the dolls and advertising materials clearly credit Paula Walton/A Sweet Remembrance for the patterns and techniques used to make them.